Step-by-step details on how to grow vegetables from seeds are given including tips for successful growing of seedlings, even for beginners. Seedlings can be grown well in advance, ready to go into the ground or container at the ideal time. In indoors, it is easy to create perfect conditions of ideal temperature and moisture. You can grow seedlings even for hard-to-germinate seeds or very small seeds. You can always buy seedlings from garden shops. But raising vegetables from seeds can be fun, exciting and challenging. It gives a full control on what you are using to grow, in fact you can grow your own organic vegetables in garden, raised beds or pots. But not all plants can be started early because all plants do not tolerate root disturbance. Seeds of cucumber (growing cucumbers from seeds), bottle gourd, bitter gourd (how to grow bitter goiurds karela), broccoli, Brussels sprouts, cabbage, cauliflower, celery, chillies and capsicum (growing chillies, capsicums and peppers), tomatoes (growing tomatoes in pots), etc. can be started early. 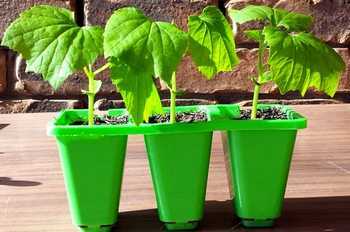 I sow the seeds of bottle gourd, zucchini and bitter gourd in small pots so that they can be easily transferred to their final position without any damage to their roots. Root vegetables such as beans, beets (how to grow beets), carrots, corn, spinach (growing spinach), turnips, parsnips and peas grow better when put directly in ground as they do not like to be transplanted. I usually start seeds in seedling trays or prunnets. Seedling trays are shallow trays so the seed raising mix stays warm. Prunnets, multi-cell growing trays, are made of soft plastic that helps to squeeze the seedling out without damaging the root ball. Seed can be sown at home directly into seedling trays or prunnets or even in egg cartons. Large garden companies, put these trays on heat propagators or in a greenhouse, but I usually place the trays at a warm place or indoors. I sow seeds of capsicum, cucumber, bitter gourd, bitter gourd (bitter melon, karela) and egg plant in multi-cell growing trays, while seeds of chili in seedling tray. Seedling trays are designed to fit bottom heat propagators. Sowing seed directly into a seedling tray gives you a good surface to work from in order to 'prick out' or just thin your seedlings. I make my own seed raising mix. I take some fine normal potting mix and add to it river sand in 2:1 ratio (2 potting mix - 1 sand). This ensures air in the root zone for successful germination. 90 percent of my seeds produce seedlings. Seeds like chillies, cabbage, cauliflower, cucumber (growing cucumbers), capsicum, eggplant, capsicum, spinach (how to grow spinach), tomatoes (growing tomatoes), etc. need no special treatment before sowing. Seeds such as beans, peas, bottle gourd (growing bottle gourd), bitter melon (growing bitter melon) and zucchini are soaked overnight in water before sowing but not watered again until the seedlings are emerge. Seeds with very hard outer covering like may be soaked in warm water to allow moisture to enter the seed so that it can germinate. If you are living in a place where the temperature is low for most of the time of the year, you can raise seedlings by using (Isom) a 60 watt incandescent light bulb over the tray or even place the tray in an oven and maintain the temperature. Seed raising thermal mats are also available. As a rule of thumb, the sowing depth should be at least double the largest dimension of the seed. So the seeds of cucumber and chillies need be covered only by a thin layer of soil, whereas the seeds of bottle gourd must be buried to 1 inch depth. Water slowly with a fine spray to avoid washing seeds away. Water only when the surface feels dry. Too much water will fill all the space in the soil eliminating air. That will fail germination as there is no aeration. It is recommended to feed weak liquid fertilizer once the green shoots appear. I, however, do not feed any fertilizer before transplant to save the young seedling from burning. When the roots reach the bottom of the container, usually after 2-4 weeks or when 4 - 6 leaves have grown, they can be replanted to their final position. Before taking out the seedlings, I water the container thoroughly, preferably with diluted seaweed solution. I replant the seedlings either in the evening or in the morning on a rainy or cloudy day. Take out the seedlings from the container and put in water to loosen the roots, removing excess soil around them so that you can separate them without damaging their roots. Select the healthiest seedlings, discard any deformed, damaged or with little root development. Make a hole and fill it with water and wait for water to be absorbed before planting the seedling carefully. In general, it is best to replant to the same depth. However, the vegetables like cabbage, broccoli, cauliflower and tomato are replanted up to the first set of leaves to increase the root area of the plant. Cover the hole with the soil around the seedling gently and water the well with a spray after planting. Put some pellets around the seedling to protect them from snails and slugs. This protection is very important, otherwise next morning you will find most of the seedlings missing! Causes of Failure : Why You Fail to Make Seedlings? The seeds may be of poor quality or very old that has been stored incorrectly at very high temperature, as high as 40 deg C.
If the soil is too heavy with not enough air may be the cause. It is better to use a good quality seed raising mix or prepare the soil as suggested above. Too much water will clog the air in the soil. Snails or birds may have eaten the seedlings.